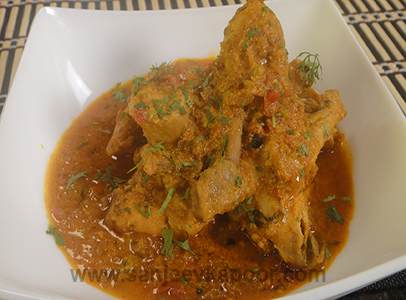 Chicken on the bone cooked till tender in a simple spicy punjabi style onion tomato style gravy. Heat the ghee and oil in a non-stick pan, add the bay leaves, both cardamoms, cinnamon, cloves, peppercorns and onions and sauté till the onions turn golden. Add the ginger paste, garlic paste, red chilli powder, coriander powder and turmeric powder and sauté for two minutes. Add the tomatoes and salt and sauté for three to four minutes. Add the chicken pieces and sauté on high heat for five minutes, or till lightly browned. Add the yogurt and sauté for five more minutes or till almost dry. Add two cups of water and mix well. When the mixture comes to a boil, cover and cook till the chicken is almost done. Sprinkle the garam masala powder, mix well and cook for two to three more minutes.